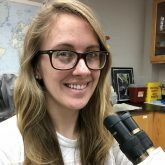 My research interests focus on developing novel proxies and archives of oceanographic and climatic conditions and using them to reconstruct Holocene paleoceanographic and paleoclimatological conditions in the North Pacific Ocean. I am currently using high-resolution stable isotope geochemical time-series data and sclerochronological analysis of modern and ancient mollusks for paleoceanographic reconstructions. (1) I am currently involved in the Unalaska Sea Ice Project, where I use stable isotopic analysis of ancient clams from archaeological middens to reconstruct past changes in sea surface temperatures and seasonality in the eastern Aleutian Islands. This interdisciplinary research is in collaboration with my advisor, Dr. Fred Andrus, and archaeologists Dr. Catherine F. West (Boston University) and Dr. Michael Etnier (Western Washington University). We are working to address uncertainties in Holocene environmental changes in the eastern Aleutian Islands by combining zooarchaeological analysis of Unalaska middens with high-resolution geochemical time-series data. Our data will allow us to better understand how past environmental variability may have resulted in behavioral changes in animal and human populations in the Aleutians. (2) I am also working on geochemical analysis of Pacific abalone shells to develop a new method for producing sub-annual records of upwelling off the California coastline. In this project, I compare changes in stable isotopic values of abalone shells with oceanographic conditions (sea surface temperature, carbon and nitrogen flux) to determine our ability to use these signals as proxies for productivity related to coastal upwelling. If successful, data generated from this method can be compared to larger spatial and temporal oceanographic reconstructions to better understand how macroclimate reconstructions manifest locally and seasonally.